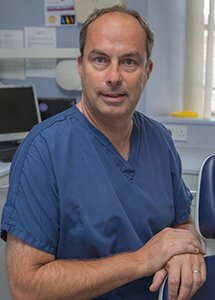 Born in Exeter, Shaun studied dentistry at Royal London Hospital and qualified in 1990. He completed his Foundation Dentist year in Colchester, where he stayed for seven years, returning to the South West to run his own practice in Barnstaple for 16 years before selling it. Shaun joined Torrington Dental Practice in 2015 and has recently taken over the domiciliary service, as well as seeing both NHS & private patients. In his spare time, Shaun enjoys football, tennis and snowboarding with his family, although more observational rather than participating.